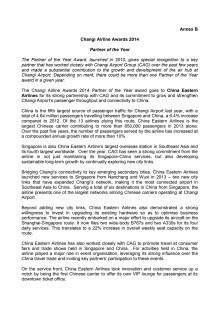 SINGAPORE, 29 April 2014 – Changi Airport Group (CAG) recognised its top airline partners this evening at the 9th Changi Airline Awards 2014 held at the Pan Pacific Hotel Singapore. The annual awards ceremony, graced by Mr Lui Tuck Yew, Minister for Transport, celebrates the partnership of airlines operating at Changi Airport and their contributions towards the growth and development of Singapore’s vibrant and world-class air hub. A total of 24 awards were presented to the airline community across six categories, namely top airlines by absolute cargo growth, top airlines by absolute growth in passenger carriage by region, top airlines by passenger and cargo carriage, best airline marketing and the Partner of the Year award. A complete list of award winners is appended in Annex A. The Partner of the Year award was presented to China Eastern Airlines, for its significant contribution and commitment to grow and strengthen its services between China and Singapore. China was the fifth largest source of passenger traffic for Changi Airport last year, with a total of 4.64 million passengers travelling between Singapore and China, a 6.4% increase compared to 2012. Bridging Changi’s connectivity to key emerging secondary cities, China Eastern Airlines launched new services to Singapore from Nanchang and Wuxi in 2013 – two new city links that have expanded Changi Airport’s network, making it the most connected airport in Southeast Asia to China. Serving a total of six destinations in China, the airline presents one of the largest networks among Chinese carriers operating at Changi. Besides strong year-on-year growth in its weekly flights out of Singapore, China Eastern Airlines worked closely with CAG to promote travel to and from China at consumer fairs and trade shows held in Singapore and China. For activities held in China, the airline played a proactive role in event organisation, leveraging its strong influence over the China travel trade to invite key partners’ participation in these events. China Eastern Airlines is the largest Chinese carrier operating at Changi Airport in terms of passenger traffic. The airline carried more than 650,000 passengers in 2013, and over the past five years, the number of passengers served by the airline increased at a compounded annual growth rate of more than 10%. 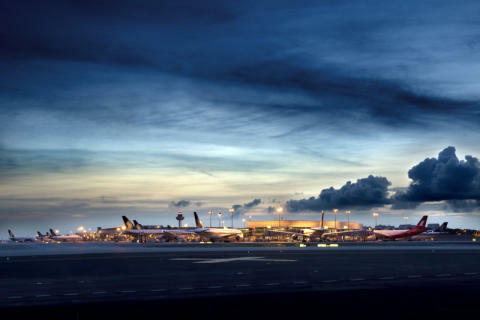 In the list of the top five passenger carriers at Changi Airport in 2013 are Singapore Airlines, Tigerair Singapore, SilkAir, Jetstar Asia and AirAsia Berhad. In the cargo airlines category, Singapore Airlines Cargo continued to top the list, followed by FedEx Express, Cathay Pacific, EVA Airways and Air Hong Kong – the latter, which moved up two places from its seventh spot a year ago. 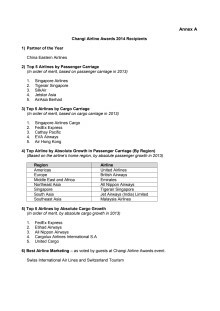 Awards were also presented to airlines from different regions which registered the strongest absolute growth in passenger traffic at Changi Airport. These were Tigerair Singapore (Singapore), Malaysia Airlines (Southeast Asia), All Nippon Airways (Northeast Asia), Jet Airways (India) Limited (South Asia), Emirates (Middle East and Africa), British Airways (Europe) and United Airlines (Americas). British Airways and Emirates were repeat winners in their respective categories whilst Jet Airways won its category for the third year in a row. After growing at a robust compounded annual growth rate of 9.6% over the past five years to register a record 53.7 million passenger movements in 2013, Changi Airport has seen the first signs of moderation, with the growth trend tapering to a more measured and steady pace. Passenger traffic in the first quarter of 2014 registered an increase of 1.1% from the corresponding period a year ago. Speaking at the awards ceremony, Mr Lui highlighted the need for close partnership within the airport community to adapt to the ever-evolving aviation trends. “It is our common desire to see Changi Airport succeed, and the close partnership among stakeholders that has allowed Changi Airport to push through with the necessary upgrades to anticipate and respond to the changing airline business models and air travellers’ needs. This is a strength that we have. We will continue to guard and nurture it. Changi Airport is the world’s fifth busiest airport for international passenger traffic. 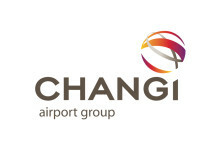 As at 1 April 2014, Changi serves more than 100 airlines operating over 6,800 weekly scheduled flights to 280 cities worldwide.